The Guinema Road Tourist Drive shows the stunning geological formations located in the rugged volcanic landscape of the Warrumbungles. 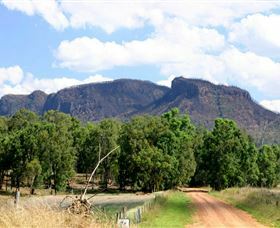 This is a pretty area of the Warrumbungles that can be viewed by car along Guinema Road. The turn off is about 20 kilometres north west of Coonabarabran, where you will discover some amazing views of the mighty ancient escarpments of the National Park. Due to the January 2013 bushfires that burnt most of the Warrumbungle National Park, new rock faces have been revealed along with columnar structures and volcanic dykes and plugs. You can now see the margins of the tuffaceous deposits and massive trachytes flows or domes which couldn't be seen before because of the heavy covering of trees and undergrowth. Part of this drive is dirt road but can be accessed by both car or four wheel drive, weather permitting. For further enquiries contact Pilliga Forest Discovery Centre. Pilliga Forest Discovery Centre is an architecturally designed, environmentally sustainable, multipurpose facility featuring the latest in interactive displays and technology. Managed by the National Parks and Wildlife Service and adjacent to their offices, the Discovery Centre incorporates a conference room available for after hours use by the community. The centre captivates visitors of all ages, helping them discover the hidden secrets of the Pilliga forest and the stories of yesteryear with this fun and entertaining exhibition. Your 'walk in the forest' reveals fauna, flora and Aboriginal cultural heritage - the Pilliga as you have never seen it before. For further information about scenic drives, walks, birdwatching and attractions in the Pilliga Forest, contact the friendly staff at The Pilliga Forest Discovery Centre and pick up maps and attraction listings to plan your itinerary. 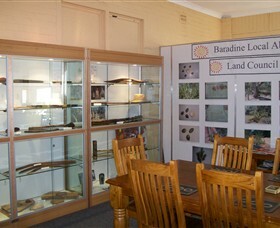 Come in and look at the local artefacts at the Baradine Local Aboriginal Land Council building. After visiting this building, take a stroll down the main street of Baradine and visit the Pilliga Discovery Centre, which will also give you opportunities to immerse yourself in the visual history of this land. 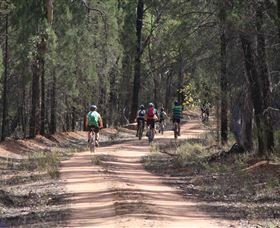 Pronounced pilly-gah, the Pilliga Forest is the largest native inland forest west of the Great Dividing Range, with over 500,000 hectares to explore. Baradine is a great place to start your adventure with a visit to the Pilliga Forest Discovery Centre. There are many scenic forest drives, bird routes, walking tracks, picnic, toilet and camping facilities, free gas barbecues are located at both Salt Caves and Dandry Gorge picnic areas. 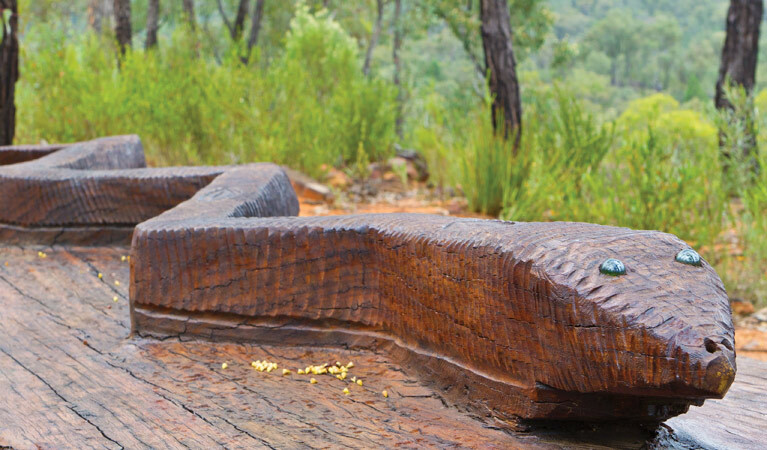 Dandry Gorge Aboriginal Area is where you can visit the latest Pilliga Forest experience and discover a hidden gem, the 'Sculptures in the Scrub'. The Sandstone Caves, Salt Caves and Dandry Gorge all have marked walking tracks. Take a look out over the Pilliga forest from the New Lookout Tower situated at the Salt Caves picnic area. Please note all plants, animals and rock features are protected. All roads in the Pilliga Forest are unsealed and driving requires extra care. The Pilliga Forest Lookout Tower is located at Salt Caves visitor area in Timmallallie National Park, about 45 kilometres by road north-east of Baradine. The visitor area has a free gas barbecue, picnic tables, interpretive signage, shelters, and toilet. The cave itself is a great example of shelters used by traditional Aboriginal people, with evidence of its occupation recorded. There is also an easy one kilometre walk to the Salt Caves Dam which is a great place to sit and spot wildlife coming in for a drink. Free camping is available but you need to be self sufficient.